Hozelock Vac (INCLUDES Gloves & Bag): Electronic Pond Vacuums: Pond Vacuums - Buy pond equipment from Pondkeeper: fishing out the best deals on the net. 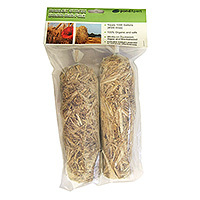 Easy to use and comes with a FREE discharge bag and a pair of long pond gloves (combined value of £17.98). 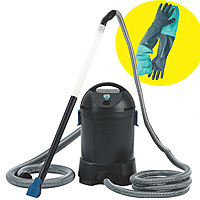 Quote VAC in shopping basket for free next day delivery! 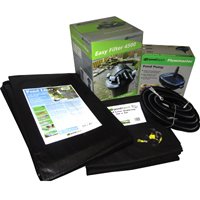 Hozelock are famous for their quality products and their new pond vacuum continues this run of success. 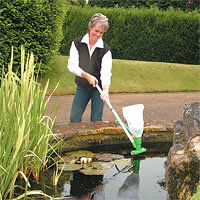 This product is compact, lightweight and removes waste from smaller ponds promptly and with minimum of effort. 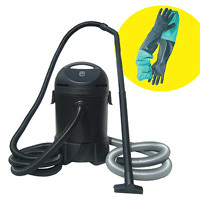 The Pond Vac is supplied with two different suction nozzles: ‘wide’ for large areas and ‘narrow’ for small corners, both of which can be stored on the handle. The water is sucked up through the nozzle by a high pressure but low wattage motor, which has chopping blades fitted to allow removal of large waste matter. It then passes up the handle which is made up from 4 x 0.4m sections, allowing the reach of the vacuum to be adjusted. The handle position can be adjusted to ensure a comfortable operation. The water finally exits via the handle, which has a transparent section for viewing the waste disposal, through 3m of flexible hose. All water and waste is removed from the pond to ensure that no harmful pollutants are returned. 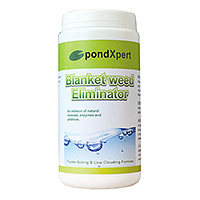 IT IS NOT RECOMMENDED FOR USE IN PONDS WHERE FISH, FROGS OR OTHER WILDLIFE ARE SPAWNING. ideal for my purpose: easy to use and "portable"